I forgive myself that I have accepted and allowed myself to not realize that Consciousness as Oneness, is Representing the Human as the Multidimensional Individual Conscious Parts as One Society, MIRRORING as Society the True Nature of CONsciousness as the World System. I forgive myself that I have accepted and allowed myself to not realize that Individual Consciousness Represented as the Thoughts, Feelings, and Emotions of the Individual as Part of Global Consciousness, are the Building Blocks of Society and the World System that Reflects The Self Interest of the Individual Parts Instead of the Individual Equality as Life, Indicating that the Individual Parts Are NOT adequately Educated As Consciousness to Understand the Interconnectedness of Life as Individual Parts, But Instead Deified that Part of the Human Experience that is NOT Life to Abuse that Which is Life, Creating World Atrocity and Greedy Self Interest. I forgive myself that I have accepted and allowed myself to not realize that Consciousness Represents the Understanding of the Ecology of Conscious Oneness, indicating a total Inadequate Individual Part as Human Causing a Conscious World that Reflects on a Creator as the Individual that is in Constant Inner Conflict, and thus Create a World in Conflict Where the Actual Real Value of Life Equal is Completely Disregarded and Even Disposed, While Evil as Individual Self Interest is Glorified through Systems that Reward Individual Evil instead of Individual Life in Equality. I forgive myself that I have accepted and allowed myself to not realize that Consciousness as Represented as Oneness and Claimed by all that Pretend to Be Spiritual, is in fact the Foundation of Life on Earth, and is the Abomination that is Allowed to Educate Each Next Generation to Glorify EGO instead of the ECOsystem as Life Equal. I forgive myself that I have accepted and allowed myself to not realize that Individual Consciousness forms Groups of Consciousness, as the Circles with which Individuals Align to BAND together to Rob Each other of the Equal Right to Life By Protecting Individual Self Interest instead of All Individual Parts Working together to Protect Life, as that Which is Given Freely Equally to ALL Always. I forgive myself that I have accepted and allowed myself to not realize that When the Profit Motive is REMOVED from Consciousness and the Individual act as the Equal Life it in Fact is, Harmony and Peace and Equality will be Restored on Earth Immediately and ALL Abuse will come to an End, Indicating that the Problem that Exist on Earth is Consciousness as the Individual Parts that form the Global Consciousness, and that Any Claim of Awareness while the Most Basic Ingredients and Building Blocks of Oneness is Not Understood, to Lie With Intent to Deceive to Protect Individual Profit, While Life as Given Freely Equally gets NO Support Unless it SUBMIT to the MOTIVE of Self Interest, as the Glorification of Individual Consciousness, which is Not Understood Even in its Most Basic Building Block as THOUGHT Creation. I forgive myself that I have accepted and allowed myself to not realize that the Greatest False Belief and Hope that Perpetuate the Current Evil of Inequality as Justified through Consciousness, is the Erroneous Idea that Something Greater Awaits after DEATH, which is Impossible and Would be Realized when the Creation Process of the Consciousness of a Child is Studied and Understood. By faith alone Life on Earth is a Failure, as Can be Reviewed in the Daily News, if one Dare to be Self Honest. I forgive myself that I have accepted and allowed myself to not realize that Just like Consciousness is the Consequence of a Lack of Awareness as to the Actual Way Consciousness is Created and sustained, so is the Consequence of Life on Earth a Death based on What is Lived and Not on What is Believed, Suggesting that ALL Faith is in Fact Self Deception and the Perpetuation of a Lie Even Visited upon Every New Life that Enter the System, with NO AWARENESS in fact Ever Arising, Causing at the Moment of Death, the Greatest Calamity that Could Ever Exist. Anyone Claiming that Greatness Exist after Death, is a Liar and a Cheat, and if Investigated, one will find the Self Interest that Fuels this Deception and the Fear that Underlie this Lie. No Amount of Faith can Change a Lie. A Lie Remain a Lie. Realize that Life on Earth is Measured as to How Life on Earth was treated upon Death. Simple Common Sense. Wake Up before Death Arrives! I commit myself to SHOW that all Consciousness Promoted on Earth as Awareness, Carries Components of Commercialized Self Interest to Profit and gain, While that which is Equal as Life is Disregarded in favor of Self Interest, with false faith as the Building Blocks of the False Image the Human Cultivate as the Culture of Human Nature. 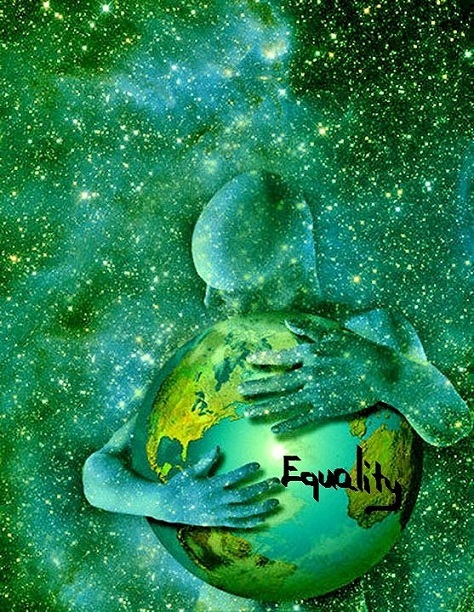 I commit myself to SHOW that When Life is Equal in All that Build Global Consciousness as the Foundation of Life on Earth, Heaven as Envisioned will Exist on Earth, and ALL parts will be in the optimum Life Experience and All Slavery and Abuse on Earth will End. I commit myself to SHOW that Anyone Claiming Consciousness without the Foundation of Equal Life Rights, Abuse Life for Self Interest using some form of Justified Knowledge that Disregard the Equality of All Life. I commit myself to SHOW that Any One Claiming Consciousness without Presenting a Solution to Restore Equal Life Rights of ALL, are in fact, Just ABUSERS of Life. I commit myself to SHOW that Consciousness as the Perception of Life on Earth, Must Be Re-born based on Principles that Recognize the Equality of Life as Foundation, to Change the World to that which is Best for All Life Always. I commit myself to SHOW that to React to the Desteni and Equal Money Message is the Confirmation that the Reactors of Consciousness is Fatally Flawed, and that the Reactor is an Abuser of Life in favor of Self Interest. Day 94: Did You Know?